Yesterday, myself and a bunch of readers embarked upon an ambitious project. It was an uphill struggle but there were sound reasons to take it on and, ultimately, we were rewarded to the tune of over fifteen thousand pounds between us. As regular readers will know, I'm always on the lookout for a rollover pool to tilt at. A rollover, lest you're not familiar, is when a previous version of the pool (normally a jackpot - pick six winners - type bet) has not been won meaning there is an amount of cash in the pot before anybody has placed a bet. Sunday was one such occasion and, with two very short favourites, it looked a four - or at least four-and-a-half - leg bet, with £40,000 in 'free money' in the rollover. 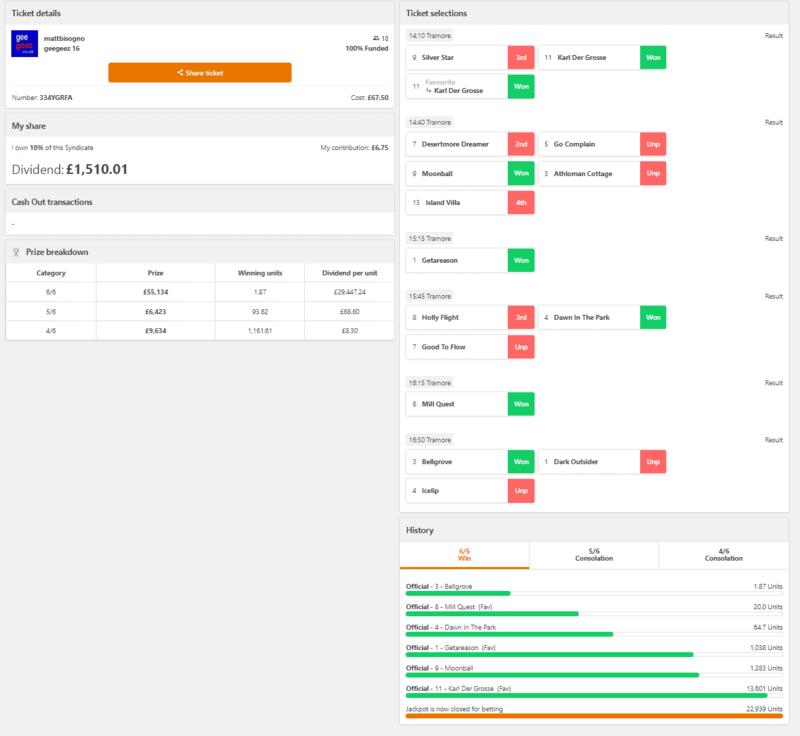 Naturally, such opportunities are not lost on the general public, and this was by far the best-supported pool of Colossus Bet's embryonic racing offering, some 23,000 £2 units staked on top of the rollover. That made for a £55,134 jackpot to aim at, with consolations for five or four out of six. Having gone close last week with five out of six, the miss being in a race where I'd noted the very strong support in the morning for the winner, I was determined - perhaps overly determined - to make amends this week. One of the benefits of the multi-day festival meetings in Ireland is that casual players of Irish racing like myself can get a feel for how tracks ride, the level of horses that compete, and any nuances in the constitution. In the case of Tramore, the tight right-handed track favours horses who can be close to the pace on the final circuit; it has moderate fare when compared with the Grade A tracks; and I've yet to see a horse beaten when leading from the turn in to the second last! 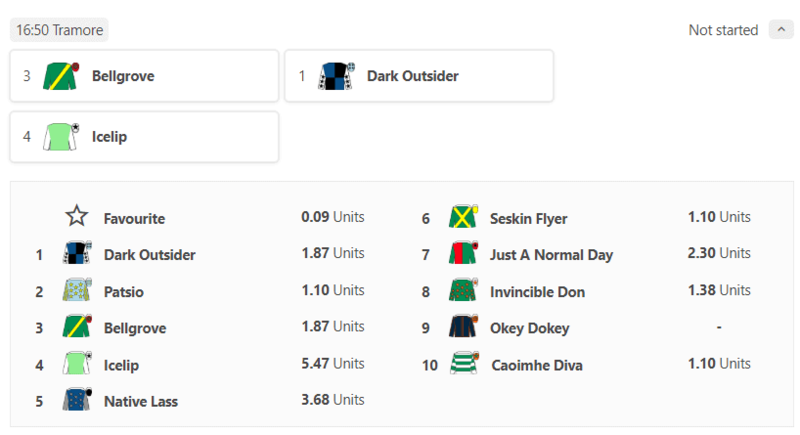 One of my Colossus syndicates had copped a few quid on the Friday evening Tramore placepot, which helped confidence if nothing else, and I loaded up on an aggressive part-permutation. I use an approach called ABCX, about which I've written here, and I had a basic tool built to facilitate the ticket calculations, which you can check out here. The upshot of all that was a 24 ticket perm which cost £1,874.50 in total. Now, before you go thinking, "Well that's just ridiculous, I could never afford that", I wouldn't make a bet like that on my own either. As a syndicate captain, I'm obliged to take 10%. In this case, I was tempted to take 20% - ah, wonderful hindsight - but didn't, and geegeez readers took up the other 90% of the perm, which is shown in full below. Now, before I go on, I just want to say that, because of the nature of this bet - across many tickets - and the Colossus platform, which only allows 'investors' to buy into a single ticket at a time, there will be some people reading this and feeling a little miffed as a result of getting in on losing tickets rather than the 'golden ticket'. 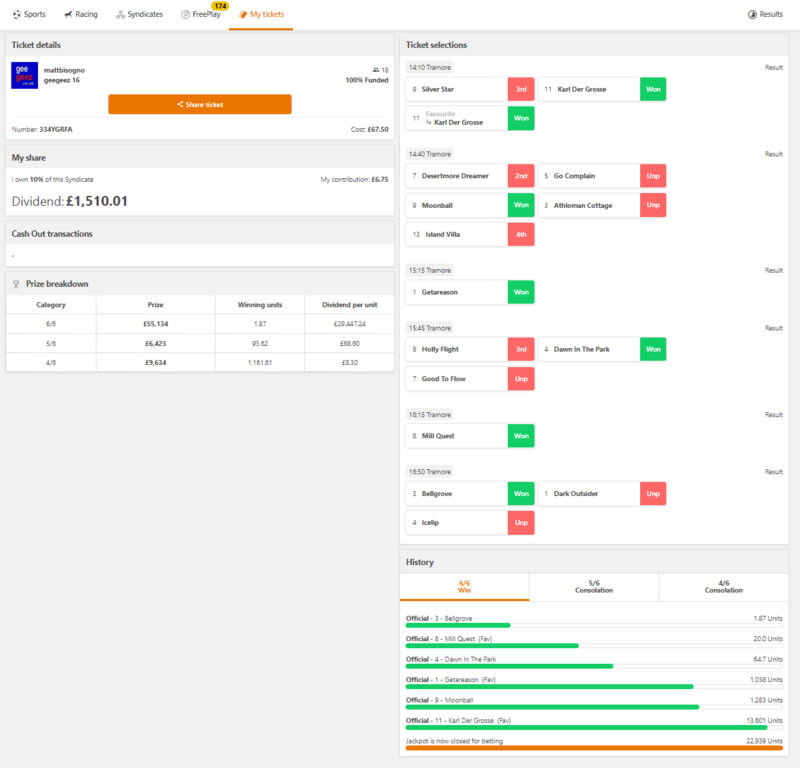 A while ago I suggested to the team at Colossus that they make a multi-ticket syndicate option available, but the reality is that the development overhead is probably bigger than the general market appetite for such a feature, which in short means it's unlikely to happen. But I did want to flag this point, and to say hard luck to those who were left or right of the winning ticket. Syndicates filled, then, and it was time for the opening race, a maiden hurdle. Wullie Millins had a hotpot with Wuby Ralsh widing, and Karl Der Grosse obliged, returning 8/15. As you can see from my tickets, I bottled the chance to bank on this one - it's a long afternoon for a syndicate watching the rest of the bet win after fluffing the first - but I was smart enough to include both racecard number and 'fav' on my 'A' lines, essentially giving double stakes going forwards. (That is, both horse number 11 and FAV were winning selections on the tickets on which they appeared). 22,939 units went into the pot, and 13,601 units emerged from the opener still breathing. Race two was a trickier affair - much trickier. It was a 16-runner 0-95 handicap hurdle, where obvious form was a serious rarity. I'd watched a couple of market moves, and had noted a couple of things, one positive and one negative, which helped to frame the play in the race, sub-optimally as it transpired. The positive note was a move for Every Chance, an Irish-trained horse which had qualified for a mark by unusually running four times in British maiden and novice hurdles. Job job, thought I, until I saw it drift like the proverbial canal boat to 16/1 in the pre-race market. As it happened, he ran a corker and, but for horlicksing the last would have been at least second - as opposed to third. The winner was a Gavin Cromwell-trained handicap debutant, the sort of horse I love and generally make top table material in such dire heats as this. But, ol' GC has been having a lamentable time of it. He had the red 14 and 30 indicators by his name, and closer inspection revealed zero winners from more than 30 runners in August. That put me off - and put me away to some degree - as Moonball, the lad in question, was downgraded to B status. Moonball was a fair winner of a bad race, with fellow B ticketer and 16/1 shot, Desertmore Dreamer, rounding out the exacta. What with Every Chance completing the tricast - not that I'd play such a bet in such a race in a billion years - it was a two grand trio of 8/1, 16/1, 16/1. We had the 10/1 fourth on B tickets as well. Academic. This made a big dent in the surviving tickets, the pool truncating from 13,601 to 1,283. Still plenty of opposition, though, even if there were four legs to go. All four had solid looking tops to their markets but, as I've discovered this week, what looks solid at Tramore is often somewhat more flaccid than first meets the eye. Leg three would bring us to half way, and it was a second maiden hurdle and an open goal for Willie's Getareason, sent off at 1/5. I was spineless here, in truth. It was an obvious 'single' (i.e. banker), but I put B tickets in with the only credible market rival, Zaofu. He was 4/1, and it was 16/1 bar them. About a sixth of the total bet stake was lost on Zaofu, and that probably wasn't smart: in such bets as these you have to 'go narrow' where the opportunity lends itself and this was such a prospect. Whilst it wouldn't have changed my overall unit staking of the bet, it would have reduced the number losers and may have allowed the promotion of a horse such as Moonball back to 'A'. That said, I doubt it: I was happy to field against Cromwell's conqueror in the trainer form circumstances. 1,283 went into that race and 1,038 emerged unscathed as the half time whistle was metaphorically blown. The second half kicked off with a beginners' chase where the market, and I, made it pretty much a two horse race. But I've seen this film before, earlier in the week, where Tramore has something of a 'Fakenham effect' on some form horses. One of the pair, Osco Mosco, was never at the races, looking somewhere between working towards a mark and horribly unsuited to the track - probably both. The other, Conduct Yourself, who looked the more likely play and was sent off at 6/4 in the end, resented the track and did fairly well to run second in my view. Of course, that has to be taken in the context of the yaks he faced, least yakky of which was Dawn In The Park, a horse I didn't especially fancy (actually, I really didn't fancy it, but it was shorter in the morning and nibbled at which was enough to scrape onto B, where I thought Holly Flight was the most likely to get the upset). Dawn In The Park made all, at 10/1. It obviously wasn't lucky because the horse was on the tickets, but DITP certainly wasn't my idea of a form winner. Nor, it seemed, was it many other people's, as the remaining units shrunk from 1,038 to just 64.7. If that was the good news, the bad news was that our permutation was seriously short-stacked: down to just one ticket, number 16. A banker in leg five, a handicap chase, seems a very brave play given I'd adding company to the 8/15 poke in the opening maiden hurdle. But Mill Quest was lobbed in old hurdle form where he'd won three of his last five and elevated from a mark in the 90's to one in the 120's in the process. Here he raced off 105. True, his prior chase form was not great, but then neither had his prior hurdle form. Long and short, he won well and gave us few moments of concern. 64.7 arrived at leg five, and now just 20 units would scrap it out in the final race for a share of the £55,134 spoils. As you can see above, ticket 16 was a 50p unit stake ticket, but that double line in leg 1 meant we had £1 (equivalent to half of the declared dividend) running on to three horses. Icelip was a well supported favourite in the morning, and there had also been plenty of money for Bellgrove, second in the race last year, with Dark Outsider looking like a form play to my eye. I'd taken a raft of others on B tickets but had already used up my two 'B' lives in races two and four, so we were all in on these three. Confidence pre-race was not high: Icelip was usurped for favouritism by Native Lass, and both Bellgrove and Dark Outsider slid alarmingly in price on course. But I recalled the Optionality experience at the Curragh a week earlier and wasn't about to press the panic cashout button now. Icelip carried 5.47 units, which was worth just north of £10,000 per winning ticket. Our half a ticket would have scooped £5,000. The other pair both had 1.87 units riding, 0.5 of which was ours in each case. Those less likely outcomes were worth £14,741.71 plus consolation bits and pieces to us. Crikey and, erm, yum! Icelip, our main hope, was given a waiting ride out back. This, I'd noted, had not been a percentage play all week at Tramore and with a few tumblers hampering his progress, he never really threatened prior to departing at the second last himself. Dark Outsider and Bellgrove were both ridden more prominently. But the former was never really going that well and dropped out tamely in the final third of the race. So it was down to the sweet-travelling Bellgrove under the best handicap chase jockey riding, Davy Russell, to bring it home. He had alternated the lead with a few others from the outset and, as they approached the home turn, Russell scooted up the inner on his agile conveyance in what was a race-winning manoeuvre. He still had to jump the last and he still had to repel the gallant but ultimately futile rally of favourite, Native Lass. Those he did, and the bunce was ours! But wait, we need to wait for the weigh in. Although this happened within the usual fifteen minutes post-race, its reporting took almost an hour and, thus, the final result remained unofficial for that same duration. I'd calmed my nerves by noting that Tote Ireland had paid out their (measly €5,800 no rollover) Pick 6 dividend some time earlier so figured we were safe. But, all the same, I wouldn't have minded an earlier confirmation of the same! We copped £15,100 for a £1,875 bet. Some will say that it's hardly a huge return on investment, and I have no truck with that. But my £187.45 stake returned £1,510 and loads of others picked up sums ranging from a hundred to a thousand quid: there were 18 of us on that £67.50 ticket. As importantly, it didn't half brighten an otherwise uninspiring afternoon's punting! p.s. If you're not playing Colossus pools, you don't know what you're missing. There is value in these pools daily, and I offer syndicates most days in the place pools, and occasionally in the win pools when the rollover looks worth it. Click here and quote GEEGEEZ to join the fun. (They'll even match your bet value in the first 72 hours of your account if you mention us in the Refer A Friend box, up to the value of £100 - which is nice). Well done and congratulations Matt. Well done, Matt! I had a fiver share of most of your tickets, including the “lucky” one, so scooped over a grand myself. Brightened up an otherwise disappointing afternoon watching Jose’s bores lose at Brighton, and more than made up for a generally poor weekend of racing results for me. Thanks a lot! Well done all. I have been trying to get on a lot of these syndicates and managed to get on a few. Nothing as decent as this but I’m sure I’ll get on one sometime in the future. I’ve been doing my own and hitting the bar but it is a fun way of punting, especially with the consolation pots to be won, which doesn’t happen on other betting platforms. Back to getting on the syndicates in time, I’ve got alerts for Geegeez Twitter set up so I can check the syndicates as soon as it’s tweeted but often find myself missing out, if only for going on 5 minutes after the syndicate was posted. Being slightly cheeky here but would it be possible to post the selections for the pot? Just so that way, someone else could take it upon themselves to create the same pot for more people to get on? Thanks for the comment and I note your frustration. The syndicates have been surprisingly popular, even when I’ve not tweeted them; so I’m not really sure what to suggest. One thing I will say is NO, it’s not possible to share selections. To do so is to cannibalise one’s own dividend! I could stake more on the bets but, again, the pools aren’t big enough (yet) to justify that approach. Great that you’re doing your own bets, too – you’ll hit one soon. I have to say I joined 4 of the 6 but as I was short of time, I missed the ‘Golden Ticket’! Annoyed with myself but gotta move on… Have to say I didn’t appreciate the approach and didn’t have the time to check them all out but get it a bit better now. I was with another syndicate over the weekend on a Pick 15 on the footy and he had the first 10 games correct on Saturday playing for £225k. Unfortunately, he only had 2-4 yesterday but is still in with a chance of a consolation which will hopefully cover the outlay. Make the next nice win soon but Colossus has certainly given me a different angle going forward! Top work Matt, and well detailed explanation of the science of jackpot-chasing. Hi Matt, as ever well done and congratulations, like others I’ve managed to get in to some syndicates and not others and have all the alerts I know of going, I also check on a daily basis to see if there are any geegeez syndicates for that day. Whilst knowing it can’t be an axact science because it depends on the complexity of the racing and what else you have on, but from what time of day is it worth logging in to Colusses to have a look if any GG syndicates are available. Thanks for understanding that, as you say, “it can’t be an exact science”. You’re absolutely spot on that it depends on what else I have going on. geegeez.co.uk of course remains the number one priority – in fact, number two, after my family, and it’s the school hols just now – so the syndicate fun has to take its place in that context. All that said, I’ll generally try to put them up between 11.30 and 1pm, so as to gauge the early markets alongside the form, and to account for those non-runners which have flagged by that time. Apologies for the unpredictable nature of things, but for the reasons highlighted above it’s likely to remain that way. Sorry to go off subject but I have had a couple of people bending my ear about the state of the Timeform reporting of Betfair Prices. They seem to be a complete guess at the moment and today I have recorded data from 6 races. On the first 3 the output was nothing like the BSP stated on Betfair Exchange displays. On another the prices initially reported were correct but then half an hour later they inexplicably changed to complete fantasies. Timeform say they are “monitoring the situation” which has been going on since Friday I am told. I was hoping you might have an ear in a high enough echelon at Betfair to get the proverbial bullet applied? Can send you screenshots from today to show problems. I’m afraid I don’t have contacts at betfair. I presume bets settled at Betfair SP are not suffering any such issues? Actual bets seem to be settled correctly – the gremlins appear when Betfair try to tell Timeform what has happened. Congratulations to all that were on that 15K. Sadly I was on 1 of non winning tickets. Since you highlighted Colossus I’ve been doing my own if I miss yours. After few close calls I finally managed to hit a pick 4 win at York Tuesday a touch under £900 for £12 investment. Ginger nuts are now my favourite biscuits!! Not sure if you or others are aware that you can also bet on colossus through a Matchbook account. Brilliant stuff, very well done on your win! I love the Pick 4 as well, it’s a bet I play on my own as there’s not really enough of a pot to syndicate.